Anyone have any experience with OceanEFX? Discussion in 'Effects, Pedals, Strings & Things' started by Marc Roy, Apr 8, 2008. I was checking out their website, and the Pearl Drive sounds really interesting, I'm really tempted to order it. Anyone use their effects? Opinons? I'm getting ready to buy a Tremolicious. Anytime I've had a question the answer has come quickly via email or even here! He's a forum member. He's beyond solid. He's posted here and at the ToneFactor Forum. Seems like a really cool dude, and those pedals do sound good! 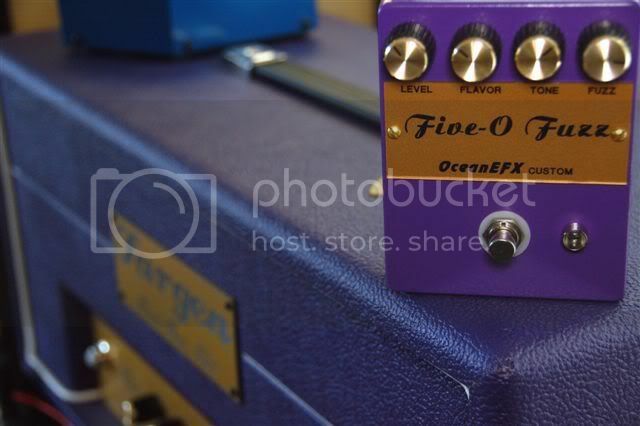 I just ordered a Tremalicious from Corby at OceanEFX, I do not use tremolo to often for an effect, but the clips sound great and the price is right. I was looking for a no frills tremolo with a volume control. This one seems to cover the sounds bases very well. Corby replied back very promptly and answered all my questions before I ordered. I got Pearl Drive #3 a few weeks ago & I'm diggin' it. Corby was great to deal with; he kept in touch with me throughout the build, had it done when he said he was going to, and put up with my dumb questions even after I received the pedal... he's very patient! Corby is definitely one of the good guys. Really top notch build quality, tone and customer service. I won his "name my new fuzz" contest and he built me this one off that perfectly matched my new Fargen amp. And it's a totally badass tonebender style fuzz to boot. Love it. As has been said, Corby is one of the good guys. He makes some really nice pedals. Im all about the Vintage Echo and the Bullet Boost. There are a few others he has that Ill get on the board soon enough. Yeah the tremalicious is really cool too. The first Pearl arrived for me a few months back and man thats a killer pedal. Really nice. He's got a pretty nice site. I have to admit that I hadn't heard of Ocean EFX but this thread caught my eye. His site is really well laid out and to the point. Haven't listened to the clips yet but I will. I think i'm interested in the Tremolicious and the Vintage Echo. His clips sound nice for sure. his pedals look really solid. more importantly, he seems like an honest, humble, down to earth person here and on other effects boards. i'd much rather buy one of his pedals than someone who cannot control their internet temper IMHO. Right back atcha, my friend...you've got some great stuff happening over in your neck of the woods as well! Very nice stuff indeed. Corby, it looks like I'll be getting a Pearl Drive from ya very soon (my damn computer at home is on the fritz at the moment). That's what I like to hear!!!! Can't wait to order one. I've got the tremalicious and the vintage echo and they're both quality boxes. The blue light on the tremalicious pulses at the speed you set it, which is a nice addition. Corby is very quick and helpful when answering questions too.